40 million people suffer from heel pain and it is the number one condition I see in my practice. Most people feel that heel pain comes about from people being over-weight, but almost anyone can develop heel pain. The most common heel pain condition is plantar fasciitis, which is an inflammation of a ligament on the bottom of the heel that can extend into the arch. Pain at the back of the heel is usually Achilles Tendinitis or Achilles Bursitis. Heel pain can also be due to a fracture, arthritis, and even a tumor. Most heel pain, believe it or not, can be prevented. The reason for this, is because a lot of the problems begin when the patient does too much, too soon, or too fast. One day, all of a sudden, you wake up with heel pain, pain that can be very debilitating. You never had it before, so you feel it will go away. The only change in your lifestyle was that you started an exercise program a few weeks or months ago. So, How Do You Prevent Heel Pain? 1) Prior to any exercise, you should warm up, stretch, exercise, cool down, and stretch. What do you stretch? Stretch your Achilles, hamstrings, and lower back, and hips. 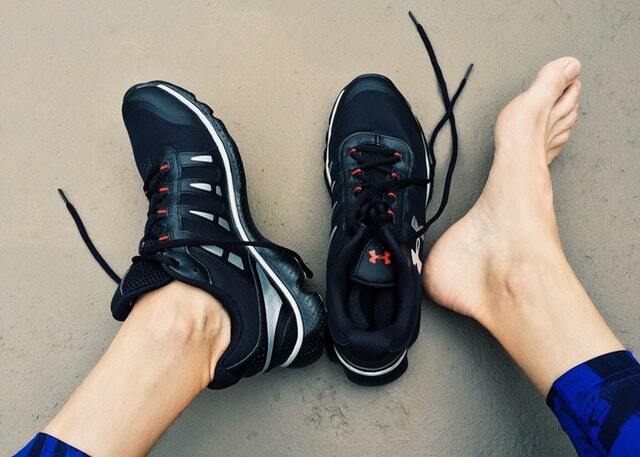 2) Wear proper shoes and the correct size. Do you know that about 80% of the people out there are weahttps://www.stopfootpainfast.com/faqs/how-can-i-tell-if-my-shoes-fit.cfmring the wrong size shoes? Yes. If you are a runner, get a good pair of running shoes. If you are playing a sport, get the right athletic shoe for your sport. For dress and casual shoes, get a shoe that supports your foot and is made of leather. 3) Eat properly. A lot of foods are inflammatory in nature. How do you know which foods can cause inflammation. Well, it depends on the individual. For example, Quinoa is supposed to be good for you, but in some people it can cause their stomach to become bloated or have other GI issues. So, if you have a reaction after eating something, like bloating, upset stomach, watery eyes, etc, stay away from this food. Tumeric is a natural anti-inflammatory. Now, of course, if your symptoms persist, you should see a podiatrist. The longer you wait for treatment, the longer it might take to cure the problem.